If you already have developed an implementation of a MCDA method, whatever language is used, you may want to reuse it directly without having to rewrite it to fit d2 expectations. d3 aims to help to integrate such existing methods. It is a web application that allows you to interact with remote services exposing MCDA methods. Data exchanged between d3 and your remote service is done trough XML files. 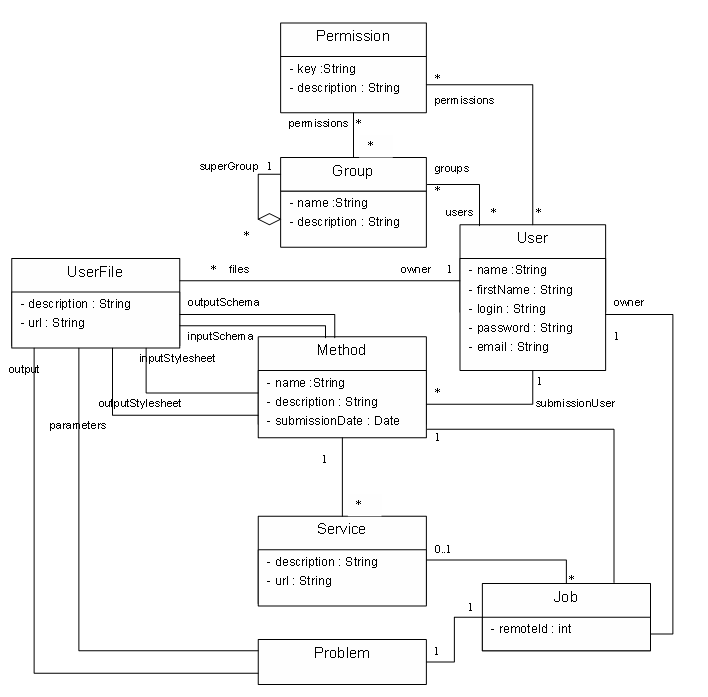 Below is a simple class diagram to help to vizualize those concepts. When registering a Method, the user must provide the method input schema and the method output schema. Also XML stylesheets can be specified to allow to visualize both problem input and problem output. Note that your SOAP service must use a rpc binding and literal encoding. You can find a WSDL sample here. Finally d3 can be used to facilitate d2 development: d3 exposes a few interfaces that allows d2 (especially) to communicate with it. See d2 integration for a more thorough insight of that integration.